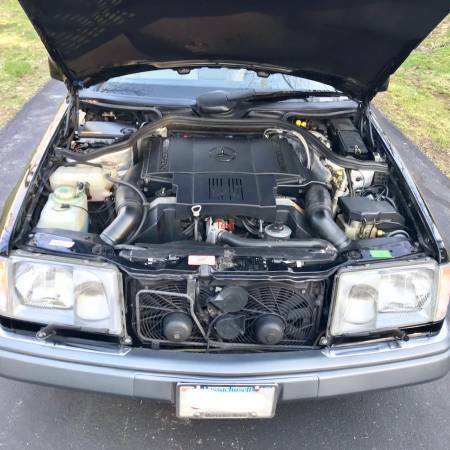 Finding a well cared for Mercedes W124 sedan is like striking gold. These era of Mercedes were very rugged and durable cars , but demanded a certain degree of maintenance more than your typical Corolla. If you followed this regimen and understood how these cars were put together, the reward was a car that drove at least as nice as a Rolls Royce and one that would last hundreds of thousands of miles. The 400E/E420 came with a 275 hp 4.2 M119 V8 that in the USA was saddled with a super tall 2.24 autobahn gearing. The only bright spot with the tall gearing is that the V8 actually gets better highway mpg than the 6 cyl cars. A 3.07 or 2.82 rear end swap really wakes these cars up off the line. 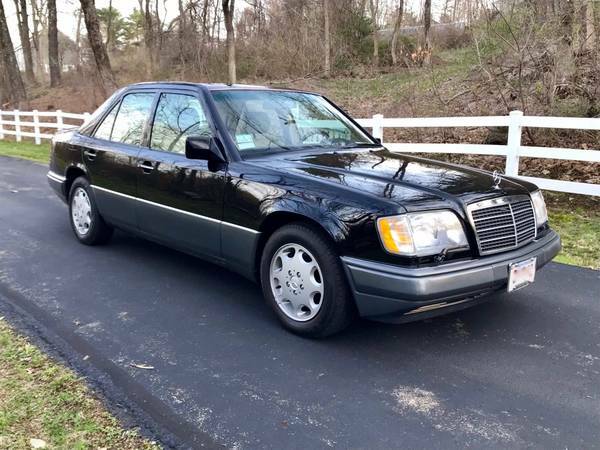 Find this 1994 Mercedes E420 for sale in Maynard, MA for $4,500 via craigslist. 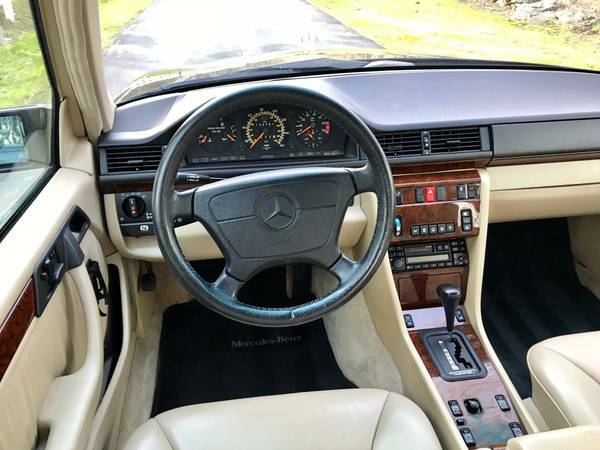 Garage kept, meticulously maintained, one owner - 1994 Mercedes E420 with all service records, dealer documentation and original window sticker. Also includes an official Mercedes E420 custom car cover. This car is in remarkable condition for its age and is a great buy for someone who wants to own a well cared for, reliable classic Mercedes. The car has 130,880-mile original miles or an average of less than 5,500 mile per year, which is low for 24-year-old automobile. Interior is in like new condition with the only flaw being a broken dealer option cup holder on the driver's side door. Exterior is in excellent condition with some very minor surface scratches and a small ping on drivers door (barely noticeable). Where the exhaust comes through the bumper there is a small crack. . The car did have some front end damage many years ago and was professional repaired and is unnoticeable. There is some minor rust on the under carriage. This car is in better condition that most cars on the road today. Mechanical the car is strong with no known issues, but it has not been driven much in the last year. Tires are in great shape and a new battery installed April 2018. I am selling the car for my mother who no longer drives and wants to see the car go to a good home and to someone who will appreciate it like she did. Any questions please pm me. Have many more pictures upon request and the car is available by appointment for inspection. The car has a clear Massachusetts title. A CarFax is available for review for the serous buyer. This is a private sale and only serious inquirers will be responded too. No trades or other solicitations please. Asking $4,500. There are some clues that key into just how clean of condition this car is: the burl wood trim looks mint, the leather seats look to have next to no wear. the steering wheel leather looks new, the engine air intake tubes aren't falling apart, and hood pad is still in tact. The E420 car is fully equipped with traction control and seat heaters which make this a great Northeast car. I think the gray lower cladding and bumpers would look better in black, but this is the way they came from the motherland.